The brand of breast implant selected by a patient is a crucial decision, a high quality, FDA approved implant helps ensure a patients’ safety and long-term satisfaction with their breast implants. The key components of a breast implant are the silicone gel inside the implant and the implant ‘shell’ that holds the gel. This article outlines why the silicone gel and breast implant shell must be of the highest quality and that Silimed breast implants have been tested by the USA FDA and meet the highest quality standards. We urge you to research and verify the type of breast implant that will be used for your breast augmentation and make sure you select a breast implant that has been tested and has approved safety. We know that Silimed implants are the highest quality, are FDA approved and have the implant size and shape needed for any patient; we know not every patient will select Silimed, but we urge every patient to ‘do their homework’ and select an implant that is FDA tested and proven safe. Silicone is available in different grades according to the end usage for the silicone- from industrial grade silicone to medical grade silicone, the medical industry uses medical grade silicone. There are difference levels of cohesion for silicone gel, with the cohesion determined by the level of cross-linking found with the silicone gel. The cohesive silicone is injected into an implant shell that is made from a silicone elastomer, the implant shell is available in many shapes- from tear drop to round. The implant shell must be strong and must be able to resist tearing and rupture, the strength of the implant shell is derived from the level of cross linking used in the silicone elastomer. 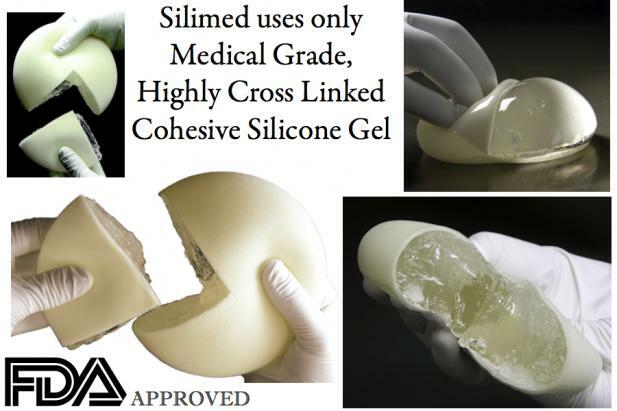 Silimed uses only medical grade, high-strength silicone gel that is a form-stable, highly cross linked cohesive silicone gel. Yes, that is a lot of words, the key is that the silicone is medical grade for your safety and highly crossed liked to remain cohesive for both safety and aesthetic reasons. The silicone gel used by Silimed is designed to simulate the feel of the soft tissue where it is being implanted, the density and consistency of the cohesive silicone gel provides a silicone feel that is similar to natural tissue. The implant shell (sometimes called an envelope) is made with the latest medical grade, cross linked low-bleed silicone elastomer. Please note the term ‘low-bleed’ refers to the implant shell and the fact that the shell is designed to prevent rupture or tearing of the implant shell and prevent the silicone inside the shell from ‘bleeding out’ of the implant shell. The silicone gel and shell used in Silimed breast implants are manufactured by a an FDA approved medical grade silicone manufacturer. The gel and shell were tested by the FDA during the FDA approval of Silimed breast implants, both the gel and shell passed all FDA testing. This is a key point- there are only 3 implant companies - Sientra/Silimed, Mentor® and Allergan® - that have USA FDA approval, this means the FDA has only tested and approved the silicone and shells used by these three companies. Put simply- using a breast implant not approved by the USA FDA means you are using an implant that has not gone through the rigorous performance and safety testing performed by the FDA. Silimed breast implants use FDA approved silicone and the implants have been tested and approved by the USA FDA. Why is medical grade silicone important? This became a common question following the PIP breast implant recall in Europe during 2012 when ‘non medical’ grade was found to have been used in some of the PIP breast implants. Medical grade silicone should always be used in any silicone device that will be implanted in your body- what person wants anything implanted in their body that is not made with medical grade materials? With breast implants, the chance of the implant rupturing is low, implants using medical grade silicone for both the silicone gel and the implant shell helps reduce the risk of rupture and ensure safety even in the event of a rupture. Why is Cohesive Silicone Important? Cohesive silicone, called gummy bear silicone by many, is important for both safety and the aesthetic look and feel. Silimed uses a highly crossed-linked, form-stable silicone gel, the gel is made into a cohesive form through the cross linking. The cohesive gel being form stable is very important, this means the cohesive silicone gel resists changes to shape, resists folds and resists wrinkles; all of these are very important for both safety (folds can lead to rupture) and the aesthetic look. A high quality breast implant is designed to have the shape and feel of breast tissue- highly cohesive silicone can hold the form of an implant with an anatomical design- like a tear drop shaped breast implant. The feel of natural breast tissue is achieved through the correct amount of cross linking in the cohesive silicone gel, too much cross linking can lead to an implant that is firm, not enough cross linking results in an implant feel that is ‘watery’. Did the USA FDA Test the Silimed Implant Shell and Silicone Gel During the FDA Approval Process? Yes, the USA FDA has tests and standards for the kind of silicone used in the breast implant and shell, the level of cohesiveness and the level of cross linking. The Silimed breast implants met all FDA testing for both the implant shell and cohesive silicone gel. Where is the Silicone Made? Silicone is made in many different countries, and not all ‘medical grade’ silicone is manufactured by a company that has been approved by the USA FDA. Silimed buys all silicone used in their implants from a USA company named Applied Silicone Corp. Applied Silicone is one of only two USA FDA approved suppliers of medical grade silicone to the medical industry. Are Silimed Breast Implants Safe? Yes. Silimed has been manufacturing breast implants for over 30 years using only the highest quality silicone, all Silimed implants are manufactured in their own FDA approved and ISO certified manufacturing facility.